This is Odie checking in once again from the beautiful state of Ohio. We had a fantastic week under the tent! God answered our prayers and gave us a marvelous move of His spirit in City Reach Dayton. I was thrilled to see several seeking for and finding God in every service. Thank you for joining us in prayer! I am sad to see this City Reach end! Last night was a wonderful finale. There were several people in the altar seeking God for salvation and receiving His touch. When the service was completed the tent came down nicely and I know that my Dad is relieved about that. I wanted to share a little bit of my week outside of City Reach. Let me back up to last Friday evening. I was at my grandparents and I set my phone on their kitchen counter. When I went to roll away from the counter my headphones were attached both to the phone and my wheelchair. I heard my phone fall to the tile floor and I was immediately sick to my stomach. 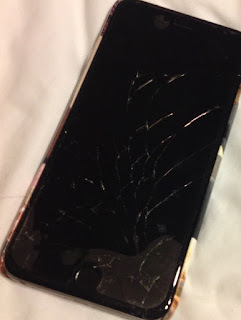 I picked up the phone to see a cracked (shattered) screen. Thankfully I have insurance and by Tuesday morning I had a replacement phone with a clear screen. Wednesday morning I had a checkup at Dayton Eye Associates. I am really thankful for this group of Doctors. They have been extremely helpful to me over the last 2 years. Thank God I received another great report this week. Everything looks great and I am praising God! When I first visited Dayton Eye Associates in April 2014 God had already began to restore my vision and I was barely able to see out of my left eye. God has now completely restored my vision to better than it was before my sudden loss of vision. Wednesday was my checkup with Dr. Amy Kopp. She is a great, caring doctor and is so good to understand my crazy unpredictable schedule. Deidre was kind enough to be my chauffeur Wednesday. We celebrated the good report with lunch. I really enjoyed our time together. Thursday I spent some of the afternoon with my Aunt Theresa and cousin Lauren Osborn. It was great to catch up with them and enjoy a delicious lunch at Royce Cafe and Coffee House in Lebanon, Ohio. We then did some window shopping at a few of the shops in downtown Lebanon. I had the lunch special of the day. Ham and Cheese Panini with Cheesy Vegetable Soup! I will close with another highlight of my week. I love getting to see my beautiful cousin and friend Jacqueline Coffman! This week I have been blessed to be with her at City Reach Dayton every single night. It has been a joy. I think I posted the following picture before but it is a favorite of mine. Jacque sent it to me while I was typing this post and I had to include it. It is definitely a trip down memory lane. 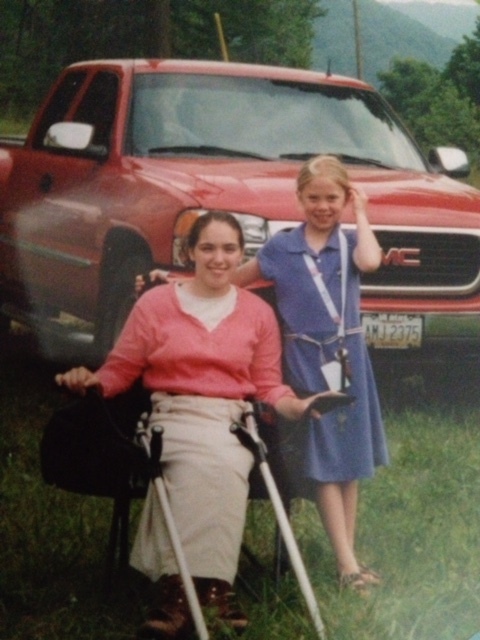 The picture was taken at our first Kentucky Outreach Revival in the summer of 2003. The Tent Goes Up In Dayton, Ohio!